This XRCD2 from the Premium label contains more than a dozen wonderful tracks from female vocalists famous for their music. The recording was very well done and the selections emphasize tracks that bring out the best in the artists. 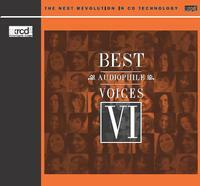 Premium Records proudly presents Best Audiophile Voices, Volume 6 — a collection of sultry female vocalists featuring a repertoire of sophisticated styles. The selection of tracks in the album will bring to the listener an eclectic mix of familiar and evocative songs. In approaching this rich collection, the performances of the artists will touch your soul as it is designed to be enjoyed and admired with your audio system. The extended resolution compact disc (XRCD2) from JVC brings the listener higher fidelity and improved quality by enhancing the process of mastering and manufacturing compact discs. The XRCD2 is compatible with all CD players. May your aural pleasures be enhanced with this album. Also available on JVC XRCD2: Best Audiophile Voices, Best Audiophile Voices II, Best Audiophile Voices III, Best Audiophile Voices IV, Best Audiophile Voices V, and Best Audiophile Male Voices.